“Services at WaveLegnth are unique. They are the most creative in coloring, foiling, cutting techniques and up-do styling for special occasions. 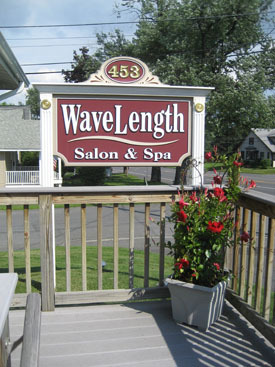 They include all phases of hair care, spa pedicures & manicures, nail enhancement services, paraffin hand treatments, facial waxing and a NYS-licensed massage therapist who specializes in Swedish, sport (therapeutic) & chair massage. Owner Ruth LaBagh and her experienced team of stylists are proud of the extensive top-of-the-line products that they use and have available, including Goldwell, Redken, KMS, Wella & Paul Mitchell.